. . . [Valentina Lisitsa] oozes charisma, and will sweep you away . . . [the "Warsaw Concerto" and the other two so-called "Denham concertos",] "Cornish Rhapsody", and Charles Williams's "The Dream of Olwen", glitter and glisten, making this one of the most captivating releases of the year . . . She can mix it up, with moments of genuine repose, amidst all the razzle-dazzle. Here she is greatly helped by her two conductors -- especially Christopher Warren-Green in the "Denham concertos" . . . [Lisitsa] is also to be congratulated on digging out some enticing rarities to complete this generous 70-minute issue. They have found another Addinsell piece, called Invocation, which is pretty good, and another Williams rhapsody . . . [that is] absolutely brilliant . . . music from "Pride and Prejudice" ends this gloriously escapist album on a high.
. . . [all the pieces] glitter and glisten, making this one of the most captivating releases of the year for anyone who loves a good tune . . . [Lisitsa] isn't a one-club pianist. She can mix it up, with moments of genuine repose amid the razzle-dazzle . . . [the Williams rhapsody that featured in the movie "The Apartment"] is absolutely brilliant.
. . . [this Album] collects some of film's most beautiful music for this instrumental combination . 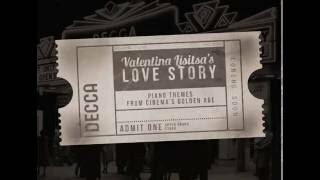 . . [Valentina Lisitsa's] performance of these screen works with the BBC Concert Orchestra is superb. She brings all the requisite concert technique and expression to the service of the score. It's all intensely Romantic and very lush, graphic music. You can almost smell the popcorn . . . A delightfully unusual track is Dave Grusin's "New Hampshire Hornpipe" from "On Golden Pond" (1981). Here Lisitsa, without orchestra, creates the convincing atmosphere of an early New England folk dance. The title music from the 1985 TV series "Pride and Prejudice", with its period feel, is an artful work by composer Carl Davis. Lisitsa takes her solo moments in this as though they were short solos in Mozart piano concertos. Pure delight. Miss Lisitsa's selection is good and she plays with the expected amount of romantic angst that the composers wrote to match a film's passions and drama. The BBC Concert Orchestra accompanies her in arrangements as good as the film's original sound and appropriate to the music.